Wayne Builders Supply | St. Henry Tile Co.
We at Wayne Builders Supply understand your needs, speak your language and are committed to providing quality products on a timely basis. Come visit our large showroom. Thanks for visiting our website and next time you’re in need of quality construction materials, give us a call at 937-548-1101. 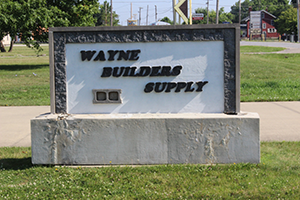 Wayne Builders Supply was purchased as an extension of St. Henry Tile Co., Inc. on July 31, 1991. When St. Henry Tile took over the property, it consisted of three buildings and some worn out equipment. There were two boom trucks, one forklift and an old block machine. Years of progressive development has demanded an entire fleet of delivery trucks and new manufacturing equipment which improved quality and service to our valued customers. Directions (from U.S. Route 127 and State Route 49 intersection): Go north on State Route 49 approximately 1 mile, our office is on the left side.